The George Taylor Mansion, a National Historic Landmark, was built by Philadelphia Carpenters in 1768, as the home of George Taylor, one of Pennsylvania's signers of the Declaration of Independence. 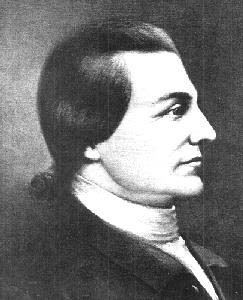 George Taylor was born in 1716, probably in northern Ireland, and came to Pennsylvania as an indentured servant in 1736. He was put to work as a clerk at the Warwick Iron Furnace and Coventry in Chester County, and by 1739 had become manager of this 1796-acre plantation. In 1742 he married Anne Taylor Savage, widow of the ironmaster for whom Taylor had been working. From 1769 to 1770 Taylor was a member of the Pennsylvania Assembly. In July 1775 he was elected to the position of Colonel in the Bucks County Assembly. Sent to the Pennsylvania Assembly in October 1775, Taylor served with distinction on important committees and helped draft instructions to delegates to the Continental Congress in November. On July 20, 1776, Taylor was appointed to the Continental Congress with four other representatives to replace the Pennsylvania delegates who refused to sign the Declaration of Independence. Taylor signed the engrossed copy of that document on August 2, or thereafter, but took no other part in the activities of the Congress, except to represent it, with George Walton, at a conference with Native Americans held at Easton in January 1777. Taylor evidently quit Congress soon afterward. In March 1777 he was elected from Northampton County to the new Supreme Executive Council of Pennsylvania, but because of illness he served only six weeks and then retired from active public affairs. From August 1775 to 1778 Taylor was also greatly involved in the production at the Durham Furnace of grape shot, cannon balls, bar shot, and cannon for the Revolutionary armies. In 1778 Taylor was dispossessed of his lease of the Durham Furnace (which had been owned by the Philadelphia Loyalist John Galloway) by the Commissioner of Fortified Estates. Taylor then leased the Greenwich Forge in Greenwich Township, New Jersey, which he operated until 1781. In April 1780 he moved from the Greenwich Forge to Easton, Pennsylvania, where he died on February 23, 1781. The George Taylor Mansion is a two-story Georgian stone house with symmetrically paired brick end-chimneys and a gable roof with flattened ridge. The main house, rectangular in shape, is five bays wide and two bays deep with a central hall that extends throughout the house. The walls, 24 inches thick, are of stone masonry rubble and finished with a thick slaked-lime stucco that gives the house its white appearance. The two-story stone kitchen wing adjoining the main house at the south end was built on the main axis around 1800. The central hall divides the four first floor rooms into pairs: the living room and parlor are on the left, and the dining room and reception (or service) room on the right. The second floor contains four bedrooms and two small dressing rooms. A short distance to the east or rear of the house is a one and a half story brick summer kitchen which was built around 1850. 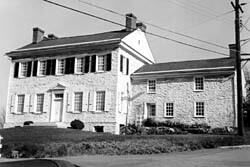 The George Taylor Mansion, owned and operated by the Lehigh County Historical Society, is located at 35 South Front St., in Catasauqua. The Mansion is open June-October, Saturdays and Sundays, 1:00pm to 4:00pm. There is a fee. Please call 610-435-4664 or visit the website for further information.